August 11th, 2008 by Michelle | Filed under Ceramic Cooker. We fried the gasket in the BGE by using a platesetter that redirected the heat to the gasket area. This avoids directing heat to the gasket, gives us a taller cooking area (more like a regular tandoor oven), gives hotter direct heat to the skewers and the ceramic briquettes will catch some of any drippings, limiting flare up. Also, since the skewer tips will nestle directly into the hot briquettes, the skewers should get good and hot and transmit heat to the inside of the meat. This time the chicken was more uniformly done and still juicy. This is a more successful tandoor cooking setup. Do you have any tips on where to find the long metal skewers that you’re using? Yes, as a matter of fact. The ones we’ve used so far are from a Persian market. Although they work, they aren’t exactly the type we want to use. We wanted something a little bit longer, more round than flat, and without the decorative twist by the hook. So we asked the fine folks at Egg Accessories to make some for us and should have some of these arriving tomorrow to test out. We’ll post Experiment 3 with our results! Nice! I look forward to the next installment. Yes, we looked at those when trying to find a good solution. But that company wants $60 EACH. It was much cheaper having Egg Accessories make some to our specification. This is brilliant! Thank you for sharing. I will definitely have to give this a try on my Big Green Egg. I recently purchased a large BGE for exactly this purpose as home tandoors are extremely expensive and the BGE can be used for a variety of other purposes. 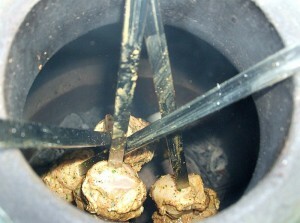 I’ve had some experience working with tandoors as I’ve worked at an Indian restaurant in NYC. 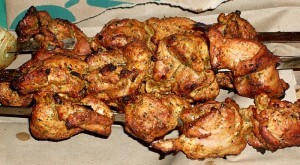 The problem of food slipping off the skewer is usually solved by threading the protein at least twice. Also, manufacturers make different widths in skewers. Typically the smaller diameters are useful for forming kebabs on the skewer as well as cooking delicate proteins (fish, chicken breasts). These make threading much, much easier and allow for the meat to be cooked much more evenly and not fall off. Larger diameters are good for whole or bone-in proteins (quail or chicken quarters). 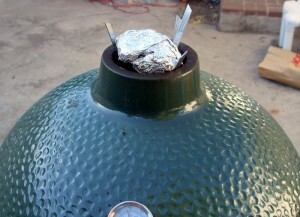 I also noticed from your pictures that the skewers barely clear the vent on the BGE. I’m not sure what the length is on the skewer, but utilizing a longer one may help with the unevenness in cooking by allowing for more spacing. Even in tandoors, the items that are closer to the fire will definitely cook quicker. If properly threaded, the skewers can be inverted for even heat penetration of the food. 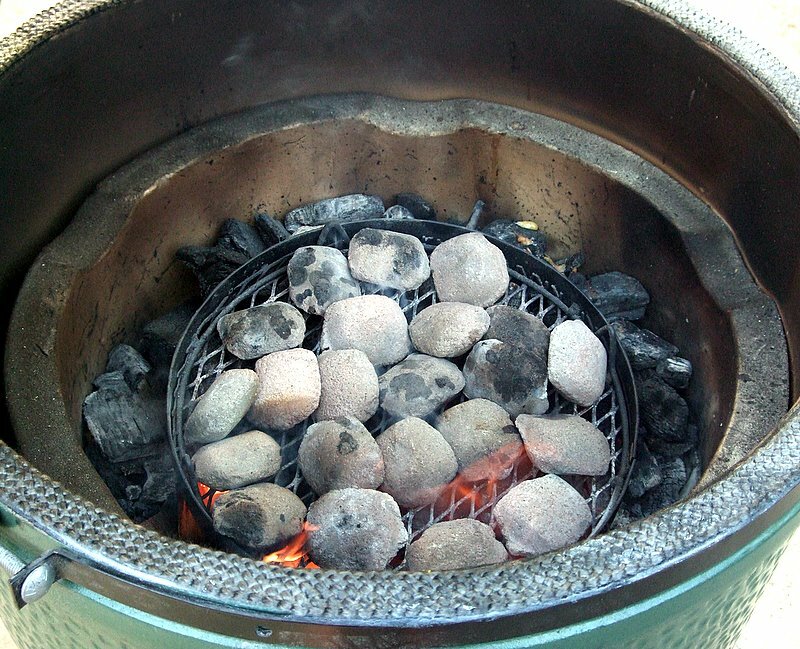 I’m curious, have you tried cooking bread on the sides of the BGE? I’ve just received my egg and will be trying this soon. Still need to pick up the bread skewers before that. Nishi Enterprise carries the bread skewers for $20 and the regular skewers for only $3 (assorted widths and lengths). I realize these posts are from a while ago, but I’m interested in seeing your results. Take care. Very cool! I built a tandoor for myself a few years ago and just recently bought a Big Green Egg. Trying to see if I can use it as a tandoor as well. I second the recommendation for skewers from Nishi Enterprise. By far the cheapest ones I could find and they are the right length for a tandoor. I may upgrade to the stainless steel ones they have now on the website. I am also interested in seeing how folks are making naan on the BGE. Straight on the grate, on a pizza stone, and direct on the coals are versions i’ve heard of. Has anyone tried sticking it to the dome?